We were pretty excited as we started the day, knowing that we were going to be able to walk through Hezekiah's 2700 year old tunnel. Gordon had been anticipating the opportunity to do this for several years, so we felt privileged that it worked out for us. 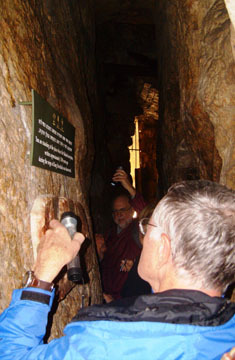 We started in the City of David, a narrow spur south of the Temple Mount., chosen for its water source, the Gihon spring. 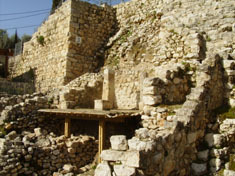 The current excavations reveal one of the largest Bronze Age structures in Israel, the Canaanite stepped stone structure. It supported a typical Israelite four-room house (from a later period), complete with indoor toilet, bordered by a public staircase. A burnt room revealed the Babylonian destruction of 586 BC. We then traveled through an ancient underground tunnel system leading us to Warren's Shaft. From there we made our way to Hezekiah's tunnel - a quarter-mile waterway, hewn out of solid bedrock, which brought water from the Gihon Spring inside the city walls, in preparation for the siege of the city by Assyrian king Sennacherib. We waded through the mid-calf water in the shoulder-width tunnel, at times only 4'9" high, imagining what it must have been like to chisel through the stone. An inscription carved in the rock near the end of the tunnel reported on how the diggers from opposite ends met, a rather amazing feat of engineering for the time. 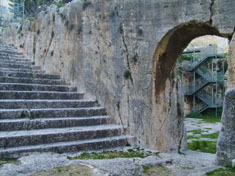 The tunnel emerged into a small pool which was originally thought to be the Pool of Siloam, but recently archeologists uncovered the steps of a much larger pool (225' side). This older, larger pool is now thought to be where Jesus directed the blind man to wash mud from his eyes in John chapter 9. We went to the Herodian quarter for lunch, which some of us enjoyed in the Quarter Cafe, overlooking the Temple Mount. We explored the Cardo shops, and saw Hezekiah's Broad Wall, a 23' thick wall built from city houses, another preparation for the attack by Assyria. The Wohl Museum showcased the luxurious "Upper City" lifestyle of the priests during the time of Herod - many private mikvaot, mosaic floors, and expensive glassware and stone household objects. These also held evidence of fire damage from the Roman attack on Jerusalem in AD 70. Our next stop was the Garden Tomb, probably one of the most moving experiences on our tour. We walked into the beautiful garden as we heard a group singing "He Lives." 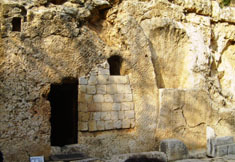 As we viewed the burial tomb, we were reminded of the significance of the empty tomb. I appreciated the words of our English guide - we didn't come to see where Jesus was buried, because the most important fact of history is that He is Risen. Our thanks to Keith for leading our time of communion, and for the chance to be quiet and reflect on how Christ expressed His love for each of us, and calls us His own. Today we experienced thousands of years of history, but one event marks the center for all eternity - that Jesus was crucified, buried, rose from the dead, and is alive today, freeing us from the penalty and power of sin forever. Hallelujah - He is risen!